WASHINGTON - St Vincent and the Grenadines has found itself mentioned in the high-profile investigation into possible ties between US President Donald Trump’s election campaign and Russia. When Trump’s former campaign chairman, Paul Manafort, and a former business associate, Rick Gates, were indicted today on 12 charges of conspiracy against the US, money laundering and several other financial charges, the Caribbean island was identified in the indictment as one of the places used by the two to funnel money. The 31-page indictment which was unsealed this morning does not mention any Russian ties, but alleges that from approximately 2006 through at least 2016, Manafort and Gates moved money through hidden bank accounts overseas in order to hide the tens of millions of dollars in income they received as unregistered agents of the former Ukraine government and political parties and leaders. “Manafort and Gates funneled millions of dollars in payments into foreign nominee companies and bank accounts, opened by them and their accomplices in nominee names and in various foreign countries, including Cyprus, Saint Vincent & the Grenadines, and the Seychelles,” the indictment stated. It is alleged that more than US$75 million flowed through the offshore accounts, and Manafort, who was fired as Trump’s campaign chairman in August after word surfaced that he had orchestrated a covert lobbying operation on behalf of pro-Russian interests in Ukraine, is accused of laundering more than US$18 million. Manafort and Gates have surrendered to federal authorities, and are expected in court this afternoon to face the charges brought by special counsel Robert Mueller’s team. The charges are the first stemming from Mueller’s probe into possible ties between Trump’s presidential campaign and Russia. There has been no official statement from President Trump. 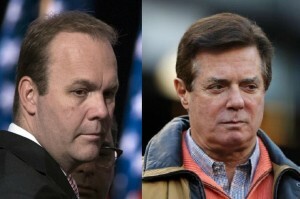 Photo: Rick Gates (left) and Paul Manafort (right) allegedly funnelled money into accounts in St Vincent and the Grenadines and other countries.